The at the bottom of the post ran in the New York Backpage, it also ran in Nineteen other major market editions as well. Additionally the story of the ad was covered on TV Networks and The Washington Times. 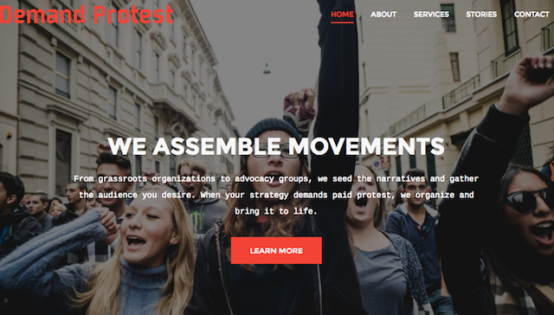 As a Demand Protest operative you will receive a monthly retainer of $2,500 on top of our standard per-event pay of $50/hr, as long as you participate in at least 6 events a year. We are extremely flexible and can work with almost any existing work schedule. Full-time operatives receive health, vision and dental insurance for families, flexible vacations, and paid trainings. Travel expenses are always paid. All operatives have access to our 24/7 phone help desk in addition to in-person support at events. I guess the phone bank is in case a protester gets arrested. I doubt it though, because the entire thing was a fraud to show how easy it is to get news coverage. The man who called himself Dom Twolipso was impressed that Tucker Carlson was the only TV anchor who knew what he was dealing with. When Dom Twolipso finally admitted it was a scam, he thanked Tucker for being the first host that didn’t buy the scam, hook, line, and sinker.